Cinnamon brooms in the grocery store are how I know it’s time. The smell hits me like a wall every year. It’s so strong and it’s supposed to be pleasant, but it’s not, not any more. It used to be, I used to be excited when the cinnamon brooms were in the grocery store because that meant all the good things. Cooler weather, pumpkins, scary movies, candy pumpkins, Thanksgiving, cranberry sauce. It still means those things, but I have to fight for those things to be at the forefront. Because cinnamon brooms also mean choking, vomit, early morning calls, hospitals, comas, hospice and unplugging. Cinnamon brooms mean holding your baby as his first father dies. It means crying in the shower but holding it together for everyone else. Writing a eulogy for a 33 year old man. Picking out flowers and pictures. Asking for memories so you can share stories with his son who won’t know him. Cinnamon brooms mean all of those things. If I’m lucky, it means more of the good, and not so much of the sad. This year will be nine years of the cinnamon brooms causing anxiety instead of anticipation. Every year the anticipation gets a little stronger and the anxiety a little less. But the smell is always as strong. This post was written as a Just Write post because sometimes it’s better to just let the words come without editing, rewriting, or checking yourself. 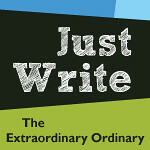 Go read some of the other Just Write entries over on Heather’s blog. Beautifully written. This is how I feel about the August sun. It looks different than any other time of year and fills my heart like cinnamon brooms. Love you. Kim~While I wish you didn’t understand, I’m glad you do. Love you! Wow. This short piece brought me so much emotion. Love to you!